As soon as we finish milking we take our buckets to the Barnhouse and filter the milk. The thick filter removes any hay or other bits that may have fallen into the bucket, while keeping all the good cream and nutrients. After filtering we chill the milk and it’s ready for drinking, baking, cheesemaking, or dipping off the cream. And wonderful cream it is! It’s incredibly good for butter, whipped cream, clotted cream, or just for spooning over berries. Jersey cows are the “Rolls Royce” of dairy cows—they don’t make the biggest quantity of milk, but it’s some of the very best quality, sweet and rich and creamy. 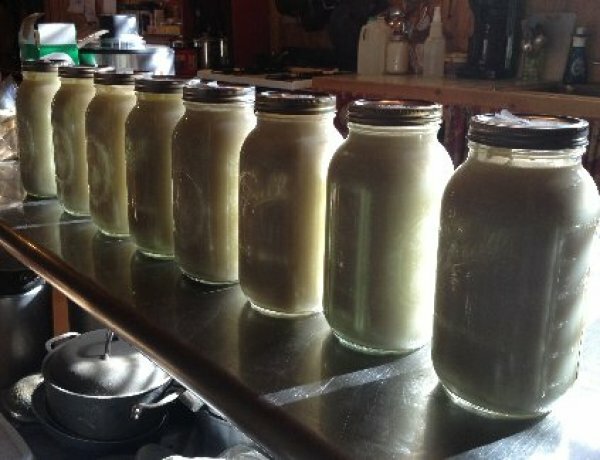 It’s not unusual for one of those half-gallon milk jars to have a pint of heavy cream on top.